Statistics compiled by the Ministry of National Security show that major crimes in Belize are on a downward trend. The figures were released and analyzed at the Ministry’s monthly meeting with the high command of law enforcement agencies in Belmopan on Monday, 9th July 2018. The meeting provided an opportunity for the Ministry to review the current crime situation in Belize where it was noted that there is an observable downward trend in major crimes. This updated information incidentally came after a meeting with the business sector including the Belize Chamber of Commerce and Industry, the Belize Chinese Association, the Indian Association, and the Belize Teachers Union; where they reportedly were of the view that crimes were spiraling out of control. The Ministry is of the view that this perception is not factual and is being spread across certain sectors of our society creating a false sense of insecurity amongst our citizens. The statistics show that major crimes for the month of June 2018 are the lowest that Belize has seen since March 2017. There were only four (4) murders recorded for that month, and while this is 4 murders too many, it is the lowest murder count recorded in a month since November 2013 when there were three (3). The Ministry believes that this improvement in reducing major crimes has come about thanks to the stellar work of our law enforcement agencies with the support of communities throughout Belize; work that certainly requires the highest commendation. 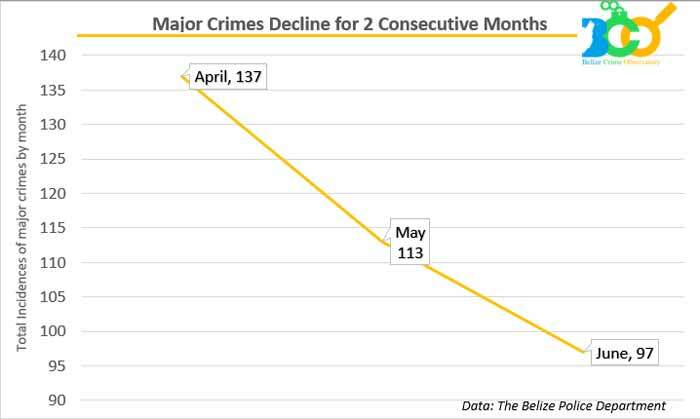 The accompanying graph from the Belize Crime Observatory shows that major crimes have declined over two consecutive months by approximately 30% since it peaked in April 2018. The Ministry of National Security anticipates that with redoubled crime-fighting efforts, coupled with the continuing assistance from our communities, the downturn will continue through to the end of the year. The Ministry of National Security congratulates the officers, men and women of the Security Forces, and the communities with whom they have partnered with to achieve the downward trend and looks forward to their continued efforts in reducing crime.